Spiral Staircase Leads To The Lofted Bedroom With Wall To Wall Knotty Pine. Located In The Solana State Forest On The Soo Line Trail. Many Miles Of Trails. The Loft is set amongst a circle of trees next to the entrance to the Blueberry Trail. It receives some welcome southern sunshine in the winter through the big living room/dining room windows. You enter the Loft through a wraparound screened-in porch and then into the kitchen. Off to the left are two rocking chairs with foot stools in front of the free standing wood burning fireplace. Ahead sits the dining table in front of the large, south-facing, viewing windows. Also on the first floor is a 3/4 bath with a shower. You ascend up the spiral staircase to the loft where two single beds reside. The Kitchen has a small refrigerator with a freezer, a two-burner cook top, microwave, coffee pot, crock pot, and a toaster oven. A CD player, air conditioner, floor/table fans as well as ceiling fans, WiFi, and an outdoor grill are also available. I have spent the last 25 years of my life firmly entrenched in the research and development world with a vast majority of that time spent in the interventional medical industry. With my creativity and engineering degree, I have managed to receive 70 US and foreign patents with 50 submissions still pending. Many of these ideas have resulted in devices which have helped people in one form or another, and in 2013, I decided I wanted to help people in another way. I acquired this property which will help people escape and relax in the beauty of the Minnesota Woods! The property has 120 acres of private lands which sits within 68 thousand acres of the Solana State Forest. The Soo Line Trail also travels right through my property. In 2013, the property was purchased by my family and has now become the Shire in the Woods. A special place, with the look and feel of a Tolkien inspired landscape, now located in "Middle Minnesota". The Shire in the Woods was formerly solely a retreat center which was founded in 1989 by three Sisters of St. Joseph of Carondelet with a vision of creating a place where people can spend time quieting the mind and opening the heart and spirit. They recognized the need for individuals living in a modern, fast paced society to be able to retreat to a quiet, nurturing place, thus replenishing the soul and deepening their connection with self, nature, each other, and the universe. The Shire still has it's roots within that theme, and it has grown much more for everyone to enjoy! Welcome to the Shire in the Woods, where the natural surroundings will nourish and rejuvenate your soul! Located 18 miles east of northern Mille Lacs Lake, Minnesota, we are tucked away at the heart of the Solana State Forest and have the Soo Line South Trail running right alongside us. Relax with a good book in front of a fireplace or take a stroll in the beautiful woods. The Shire can serve you, your family and friends, facilitate special groups, workshops, and meetings, host a wedding, hold a family reunion, and more! No matter where you are at in your writing practice, the natural beauty and tranquility of the Shire is perfect for a writers retreat. The outdoors and especially the circle drive would be great for demonstrations with horses for example, or you can come and just be a hermit! Whatever your event or occasion, we will work with you to best serve your needs. 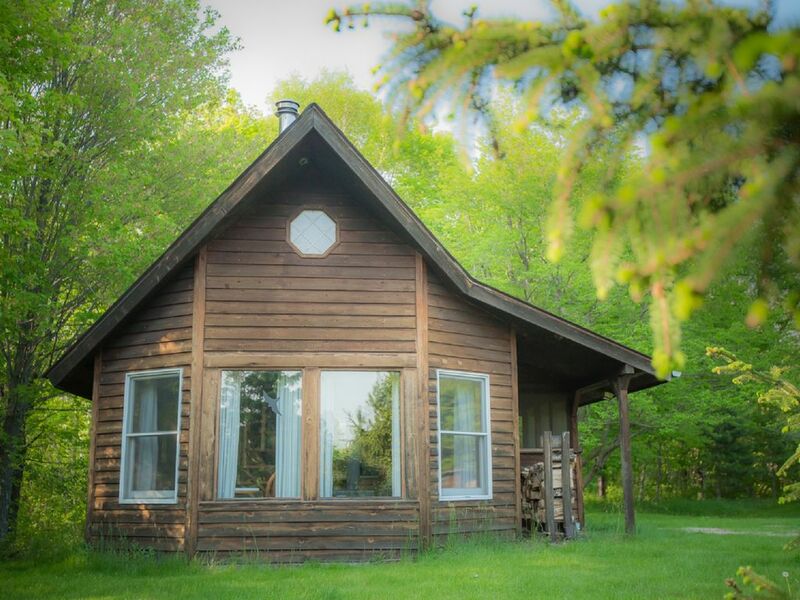 Our private, wooded retreat has seven, year round dwellings and more. There are four smaller cabins (The Woodlands, The Birches, The Meadows, and The Loft), The Cedar House, The Tree Lodge, and a gathering space, movie theatre, presentation media space, and library in The Octagon (unless privately reserved). Other features of the Shire: • Screened-in gazebo. • Wood burning sauna. • 5 miles of groomed trails. • A rose garden. • A labyrinth. • Beaver, frog, and turtle pond. • Tree swings and hammock. • Outdoor fire pits and indoor fireplaces. • Access to the Soo Line Trail. • Access to many miles of trails in the Solana State Forest. • And much more including our horses, a miniature donkey, and a miniature horse. As a guest, you can experience our animals antics and social systems, pet them, and with prior arrangements have guided interactions or feed them treats. All of the places are arranged in their own unique setting such that you feel like you are the only one there! There are many things to do in and around the Shire. Enjoy wooded solitude on the private trails or hike in the Solana State Forest, meditate while walking the Labyrinth, spend time around a campfire, read or relax in front of the cabin fireplace, and more! The Shire in the Woods offers many winter and summer vacation activities for everyone to enjoy. • Enjoy wooded solitude on the private trails. • Hike in the Solana State Forest. • Meditate while walking the Labyrinth. • Spend time around a campfire. • Read or relax in front of a fireplace. • Play catch with Frisbees or partake in other games on one of our many groomed lawns. • Star gaze or moon watch. • Use the telescope in the gazebo. • Interact with the horses. • Cross country ski or snowshoe on our private or surrounding trails. • Yoga in the Octagon. • Rock/agate hunt or swim in the nearby spring fed Quarry Pool. • Ride bikes in the woods or other trails. • Horseback ride on the Soo Line trail or Solana State Forest Trails with your horses. • Snowmobile or go ATVing on the Soo Line Trail or the Solana State Forest Trail. • Spend time in the Pliny Wildlife Area or Ruffed Gross and Woodcock Habitat Area. • Plan your next birding or photography adventure. • Enjoy the sounds of nature as the many frogs, owls, wolves, and birds vocalize and sing their songs! Located in the Solana State Forest on the Soo Line Trail with many miles of private and forest trails for hiking or hunting right out your door. It has a spiral staircase rising to the lofted bedroom. Wood burning sauna nearby in a separate building. We had such an amazing time getting away from normal life and enjoying the forest. The little cabin was magical and the surrounding trails were so beautiful with the fall colors. We were well accommodated when we needed things, which was rare. And the cabin stayed super warm on the colder days! The cabin was adorable and I loved the wood burning stove. It was just what I needed for a quick winter get-away. My husband and I spent our honeymoon at the Shire. We were greeted by very friendly employees the given keys to our cabin. It was super comfy and a perfect get away for 2 people. We loved exploring the trails right behind our cabin and eating at the cute local places. The only thing was there are 2 single beds which we pushed together. We wished there was a larger bed for the Loft cabin. Would have even paid an it more! But we loved our stay and hope to come back again!! It was a great weekend for girlfriend and I. It had everything we needed. I know it didn't have a shower before but I liked that a shower was put in. It is a little small but it worked great for us during our stay. It was also nice and quiet. The dogs were friendly and the animals was fun to pet and feed. The Loft was a sweet and cozy getaway that had everything we needed! the woodstove and kitchen necessities. Owner was always available, thoughtful and accommodating. Definitely check out the on site sauna and all the animals on the grounds. We'll definitely be back! Welcome to the Shire in the Woods, where the natural surroundings will nourish and rejuvenate your soul! Located 18 miles east of northern Mille Lacs Lake, Minnesota, we are tucked away inside the heart of the Solana State Forest and have the Soo Line South Trail running right alongside us. Relax with a good book in front of a fireplace or take a stroll in the beautiful woods. The Shire can serve your family, friends, hold your next retreat, facilitate special groups, workshops, and meetings, host a wedding, and more! No matter where you are at in your writing practice, the natural beauty and tranquility of the Shire is perfect for a writers retreat. The outdoors and especially the circle drive would be great for demonstrations with horses for example, or you can come and just be a hermit! Whatever your event or occasion, we will work with you to best serve your needs. There are many things to do in and around the Shire. Enjoy wooded solitude on the private trails or hike in the Solana State Forest, meditate while walking the Labyrinth, spend time around a campfire, read or relax in front of a fireplace, and more!